Blog Put a Lid On It! Let's Reunite the Neighborhoods on Both Sides of I-280! Imagine what life was like before I-280. For some of us, we have distant childhood memories of orchards and neighborhoods of the pre-freeway era. Land was cheap then and burying a freeway in San Jose would have been a ridiculously expensive concept. But land in this area is now scarce, prices are high and we need to have a vision that reunites our neighborhoods and improves the quality of life for all. 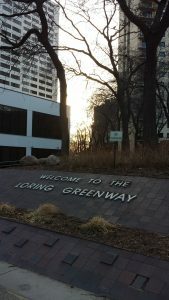 Click here to learn more about the Loring Greenway Association in Minneapolis. But to a paraphrase a sage from those bygone years, the times continue to change. As my travels take me around the country, I see examples, whether in Las Vegas at the Convention Center or Minneapolis at the Loring Greenway Association, of communities that have literally bridged the divides caused by the rapid expansion of the Baby Boom era. This video will look at examples from around the U.S. where communities have capped freeways, recaptured air space and, effectively, created new land. First, let’s move up the coast to a pioneering project in Seattle and the Freeway Park conceived in the late 1960s and opened in 1976. This park, built over I-5 was financed through a combination of local bonds and state and federal highway funds. It was propelled forward by individuals, public partners and private development, as evidenced by the 21-story building that anchors the edge of the park. One of the innovative things about this is that it embraces the idea of decoupling parking from living spaces, as leaders saw the importance of reducing pollution by keeping cars away from the downtown core. Trenton, NJ exposed its river shore by covering a freeway with a 6.5-acre park for $150M. This improvement spurred surrounding development and increased the values of homes and lots that suddenly had a view of something other than traffic. New York City, where land is in limited supply, has many examples of using air space to create new land, such as Rockefeller University. Rockefeller University even built student housing over FDR drive. Another New York City project is Hudson Yards, which is a 28 acre platform over an existing railroad yard that will feature more than 17.5M square feet of commercial and residential space. The population living in the 5,000 residences will be able to send their children to a 750 student school and avail themselves of 14 acres of open space. Related Companies is building this $20B project and soon will be bringing their expertise to the city of Santa Clara with the City Place, which is being built on old landfill. Further north, Boston has been working with the Massachusetts Turnpike Authority to determine how to use the 23 parcels above the Turnpike through Beantown to reclaim 44 acres of unused airspace. One of the initial projects is the Fenway Center, which promises 1.3 million square feet of mixed use space over 4.5 acres. The developer is apparently able to deduct the cost of the deck construction off the cost of rent for the air rights. This project has been in the planning stages in various forms since 2007 and, as of April 2016, is still renderings only. Israel, which is the Silicon Valley of the Middle East, is embarking on its most ambitious municipal project ever with the Ayalon Park in Tel Aviv. It will bridge a highway, as well as connect two existing parks with a 59 acre lid that is estimated to cost $525M. It will feature green spaces to absorb pollution, open spaces and sporting facilities for leisure and commercial space. Coming back to the heart of the United States, sprawl-happy and car-happy Dallas proved it could reunite neighborhoods with the construction of the 5.2 acre Klyde Warren Park. Conceived of in 2002, construction began in 2009 was completed at a cost of $110M with almost half of the funding coming from privately raised funds. It is owned by the city, but is privately managed. In Hollywood, a 30-year-old idea to cap the 101 is slowly making progress. What is interesting to note is that it is estimated to cost [PDF] twice as much for an area that is ⅔ the size of the Ayalon Park in Israel. 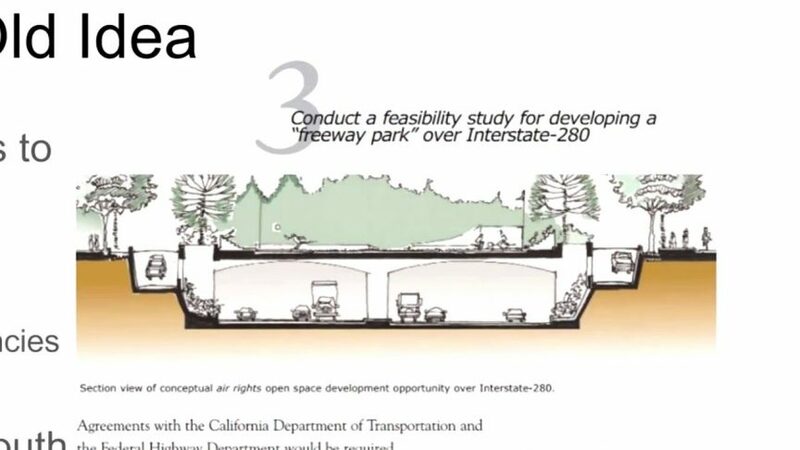 There are many more examples that could be provided, but the important take-away for those of us wanting to reunite both sides of I-280 is that these projects require long-term planning. These projects tend to be community-driven with a variety of stakeholders that include local citizens, developers, cities, states and government agencies. In short, it takes a long-term vision and a team effort to unlock the inherent value of the air rights over public spaces. By providing a relatively large area, we have a blank canvas to improve the quality of life in an area that was built out decades ago. Of course, the big hurdle is always funding. But, there are many sources if we get creative and look at it with a long-term vision. So capping I-280 is not a new idea. In 2002, the city of San Jose considered doing a feasibility study – [that was driven by the Burbank/Del Monte NAC] – to understand the possibilities and how it might be funded. Now, with such great demand for the limited land we have and the massive changes we are seeing in terms of growth in this area, it is time to revisit the feasibility of reuniting the North and South sides of I-280. “Here is how the city might sell off the development rights to pay for a freeway cap. Developers of commercial or residential projects in the Hudson Yards area have an opportunity to receive a zoning bonus that would allow their project to exceed the “base” maximum floor area ratio (FAR) established in the Zoning Resolution by making a District Improvement Bonus (DIB) payment to the Hudson Yards District Improvement Fund. The District Improvement Fund will be used by the City to help finance density-ameliorating infrastructure improvements in the Hudson Yards area, including the No. 7 Subway Extension and new parks and open space. The base maximum FAR and the maximum additional FAR that may be acquired through DIB payments are set forth in the Special Hudson Yards District provisions of the Zoning Resolution. And more detail on the cap over the FDR freeway in New York that The Rockefeller University is using to expand its campus in a land-starved part of the Upper East Side. This is a good history of how one cap was developed in Reno, NV over I-80. The cap started life as a platform for a mid-rise casino that was never built. 25 years later, it was revitalized and a Walgreens was constructed over the freeway. This Walgreens is now one of the busiest in the country. Here is a good overview of other projects and the push to reconnect neighborhoods, including the creation of what could be 45-acre public space ribbon along a two-mile stretch of Seattle. It would start as a 14,000 square foot lid-park with later expansion. Another highlighted project is ReConnect Rondo (RCR), which reconnects a poor neighborhood that was split by I-94 in St. Paul.